I need to offer a public apology to my little flan tin. Instead of using it properly – carefully lining it with pastry, blind baking and all the rest – it has been ignobly demoted to the role of a glorified cookie cutter. But these little beauties are the result, so I don't feel too guilty. Nearly all the work to make these tarts has been done by someone else: the puff pastry comes from the freezer and the filling from the deli or jars. Getting out my flan tin to give the pastry a pretty scalloped edge gives me some vague sense of hands-on involvement. Other than that, it's the work of mere minutes, so this is closer to instructions for an assembly job than a serious recipe – and that's really all it needs to be. I fill these tarts in dozens of different ways but it's of no use to you if I don't pin down something resembling a recipe, such as it is. This is one way I make them and you'll see it's very easy to adapt. Consider it a template. Make them in whatever shape you like and fill them with whatever treats catch your eye at the deli counter. Sometimes I'll spoon a little caramelised onion inside or fresh pesto over the top, or get wild and loose with melting cheese and whatever herbs are to hand. If they're in the fridge – and they often are – I'll use my homemade semi-dried cherry tomatoes. They share the low-effort spirit of this recipe, or maybe even lower: you make them while you sleep. Cut two discs from the pastry, using the top edge of a 12cm (5 inch) flan tin. With the tip of a sharp knife, score a circle about 1cm (a little less than ½ an inch) in from the edge without cutting all the way through the pastry. Brush the outside edge with a little of the oil the artichokes came in. Place the pastry on a baking sheet and cook for 15 minutes, or until it is well risen and just beginning to turn golden. Remove from the oven. Using a spoon, press down the centre of each tart until flat. 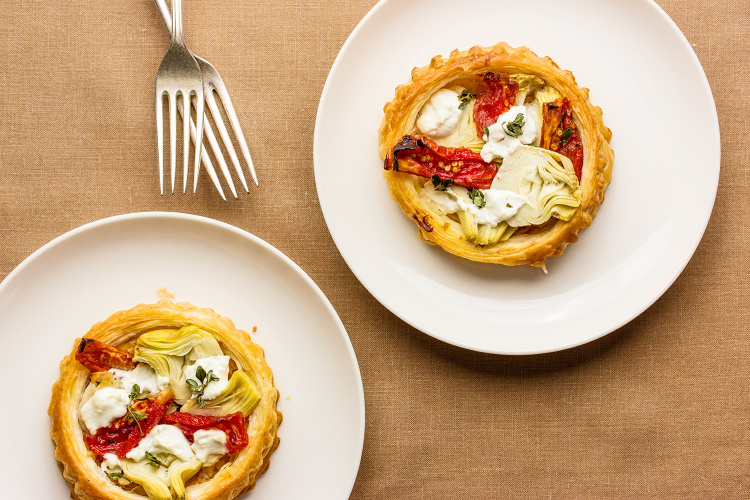 Fill each tart with a marinated artichoke cut into 4 slices, and 2 tomatoes cut in half. Dot with some little blobs of goats curd and sprinkle with a few leaves of thyme. Return to the oven for 10 minutes or until the pastry is crisp and golden brown. (Do keep an eye on it: it can turn very dark, very quickly.) Serve immediately.